CHIANG MAI: The government has stepped in to find ways to end the dispute over a controversial project to construct a new office and housing for judicial employees at the foot of Doi Suthep in Chiang Mai province. The move comes as civil and conservation groups threatened to ask the prime minister to invoke his all-powerful Section 44 power to cancel the project. They have also launched a petition seeking royal intervention. Prime Minister Prayut Chan-o-cha said yesterday (Apr 3) that he has already instructed the National Council for Peace and Order's (NCPO) legal team to find a solution. As an initial measure, authorities have been told to properly handle management of the project, Gen Prayut said, stressing the need to restore areas where forests have been felled for the construction. “Areas must be restored to their former state. Talks will be held between the NCPO’s legal team and the court to find a solution,” Gen Prayut said. The PM said there are two different parts of the project to consider: the office buildings which are located on a plain ground area and the houses which are located at the foot of the mountain. The project has drawn fierce criticism from locals, who said that it will have a negative environmental impact on the forest. However, officials from the Region 5 Court of Appeal office, which owns the project, insist that it is in compliance with the law. 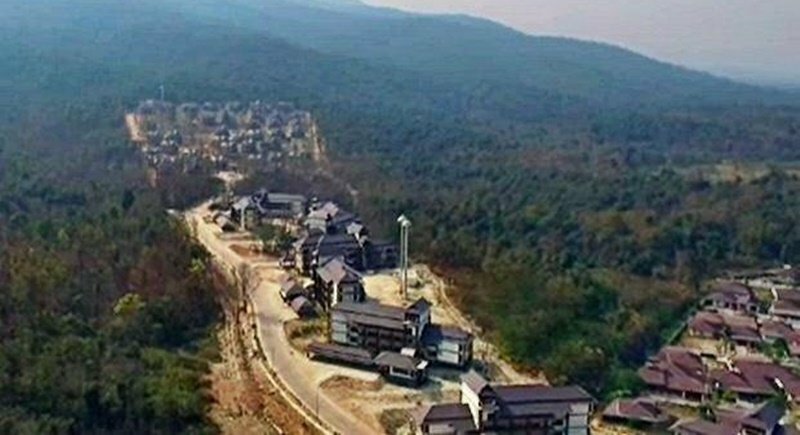 The construction site is located on Treasury Department land in tambon Don Kaew in Mae Rim district and it is not part of the national park, the office said. But conservation groups and local people are unhappy, saying that even though the project is legal, it is inappropriate to build housing there. While the area is not part of the national park, the construction site stands next to it. The Office of the Judiciary has given assurances that measures will be put in place to improve the environment and replant trees after construction. Also yesterday, John Nopadon Vasinsunthon, a legal adviser to the protesters, said that he is gathering signatures to support a petition to appeal for royal intervention to end the project. Krit Yiammethakorn, a local resident, said he and a friend will today (Apr 4) walk from Chiang Mai to Bangkok to hand a letter to Gen Prayut asking him to use Section 44 to revoke the project. Talks were originally planned between representatives of the Region 5 Court of Appeal office and protesters on Monday (Apr 2). However, Teerasak Rupsuwan, a conservation group coordinator, said that a soldier telephoned him on Sunday night (Apr 1), saying the court’s representatives had cancelled the talks without giving a reason. Earlier last month, army chief Chalermchai Sitthisad, who is also the NCPO secretary-general, instructed soldiers from the 3rd Army Region to inspect the construction site and a conclusion was reached that the project is within the 147 rai of land permitted for construction. Gen Chalermchai has given the construction the go-ahead, saying that the project does not encroach on the forest or violate any laws. He also said the construction has proceeded to a point where it is too late to be halted as more than B1 billion has already been spent on the project.